All he wanted to do was fit in, but the villagers were terrified of his truth tables and aphoristic style. Wittgenstein is usually sort of divided into two philosophers: "early Wittgenstein" and "later Wittgenstein". 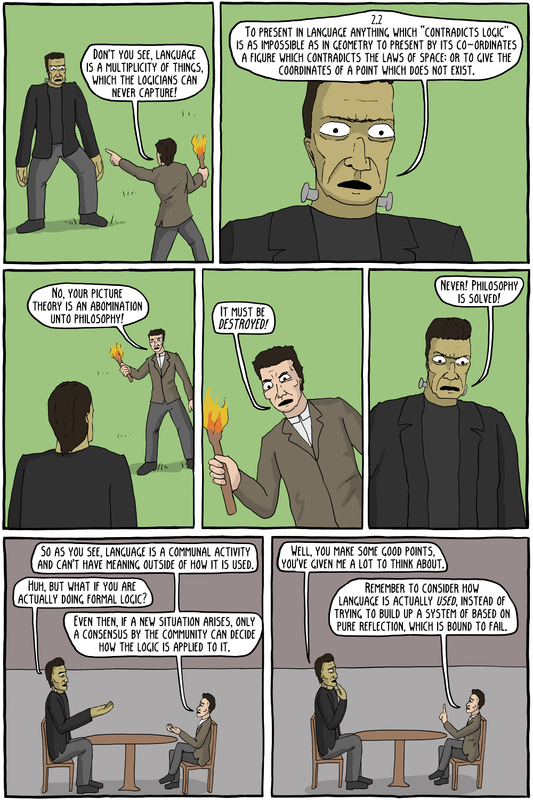 Early Wittgenstein is from his only published book, Tractatus Logico-Philosophicus. The Monster is quoting from the Tractatus in most of his dialog directly. It was highly influential in its time, especially among the logical positivists. Later Wittgenstein refers to his thought from Philosophical Investigations (published posthumously), which contradicts much of his thought from the Tractatus (even directly saying that the "Author of the Tractatus was mistaken"). In it he claims that language is not the sort of thing that can be analyzed from a logical basis, as he had claimed in the Tractatus. So, for example, when we are at a table as ask "to pass the salt", we are not referring to an object (the salt) in the world, but rather expecting the other people to take our meaning in a social situation (and in other situations there could be no salt at all, for example if it was meant as a joke). Without a communal understanding of entire situation, the language act cannot have meaning. To ask for the salt is more of a move in a sort of "language game", where we expect a certain kind of move back from the other players (i.e. the other people at the table). The explain the gesture as a reference to the world, or as a logical proposition, is a mistake about what language is at its core.